Step 1 Cut each chicken thigh crosswise into three pieces. In a medium bowl, prepare the yakitori sauce by combining the soy sauce, mirin and sake. Set aside 3 tablespoons in a separate bowl. Add the chicken pieces and marinate, refrigerated, for 20 to 30 minutes. Step 2 Soak the bamboo skewers in water at least 20 minutes. Start a two-stage fire on the grill, mounding the hot coals to one side of the grill (this will be the hot side of the fire). Step 3Remove the chicken from the marinade (reserve the marinade for brushing on the chicken during grilling). 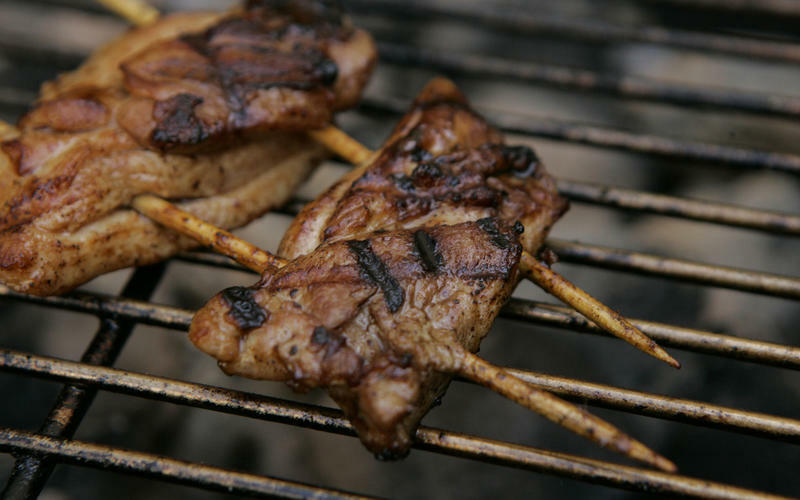 Thread the thigh pieces onto the skewers, a couple of pieces at a time, one skewer at the top and one at the bottom of each piece for greater control while grilling. Step 4Grill the skewers over a medium-high flame, turning occasionally and moving from the hot side of the grill to the cool side as necessary to avoid flare-ups. Just before the meat is done, brush the meat lightly with a little of the reserved marinade. Step 5Cook until the chicken is cooked through but not dry, about 10 minutes total. Remove to a platter and serve. In Recipes-list.com we have selected the most viewed recipes from category - Grilled Main courses . Enjoy the best recipes specially selected for you! Chicken thighs with yakitori sauce is the right choice that will satisfy all your claims. In Recipes-list.com we have selected the most viewed recipes from all categories and cuisines. Enjoy the best recipes specially selected for you!